Come into Portland Street Honda to take advantage of this exciting offer! With the purchase or lease of any new Honda vehicles, receive a $500 rebate! 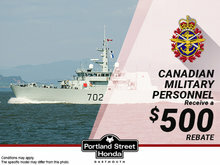 This offer if for all current and previous Canadian Armed Forces members who have served or are serving in Canada. Portland Street Honda wishes to recognize and reward their commitment to our country. 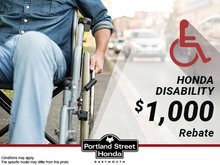 Contact Portland Street Honda for more information.